Oklahomans are no strangers to Mother Nature's whims. From tornadoes and floods to wildfires and winter storms, the state sees more than its share of natural hazards. But prior to 2009, "terra firma" in Oklahoma meant just that—earthquakes rarely shook the state. Then, after decades of seismic quiet where the state averaged less than two quakes of magnitude 3 or greater a year, Oklahoma suddenly saw a sharp uptick, to 20 such quakes in 2009. By 2013 there were 109 such quakes. Since then, the numbers have soared, reaching 903 in 2015 before dipping last year to 623. In the process, Oklahoma has surpassed California to become the most seismically active of the lower 48 U.S. states. In 2011, a magnitude 5.7 quake and two related magnitude 5.0 quakes struck near the Oklahoma town of Prague, causing damage and injuries. Then last Sept. 3, a magnitude 5.8 quake struck a few miles northwest of the city of Pawnee, population 2,200. That quake, which occurred on a previously unmapped fault, was the strongest ever measured by instruments in Oklahoma. It shook a large area of north-central Oklahoma and was felt throughout the Midwest and as far away as Phoenix and Pittsburgh. Even before NASA studied the Pawnee earthquake, studies published since late last year by the United States Geological Survey and other institutions suggested that the earthquake was human-induced due to increases in wastewater injection related to petroleum operations. Injection wells place fluids underground into porous geologic formations, which scientsts believe can sometimes enter buried faults that are ready to slip. To shed additional light on the source of the Pawnee quake, a team led by geophysicist Eric Fielding of NASA's Jet Propulsion Laboratory in Pasadena, California, used enhanced seismic data and satellite image analysis to more accurately estimate the location and extent of the fault responsible for the quake, its hypocenter (the point below Earth's surface where the quake began) and its aftershocks, and to measure how the fault moved. Results of their study were published recently in Seismological Research Letters. 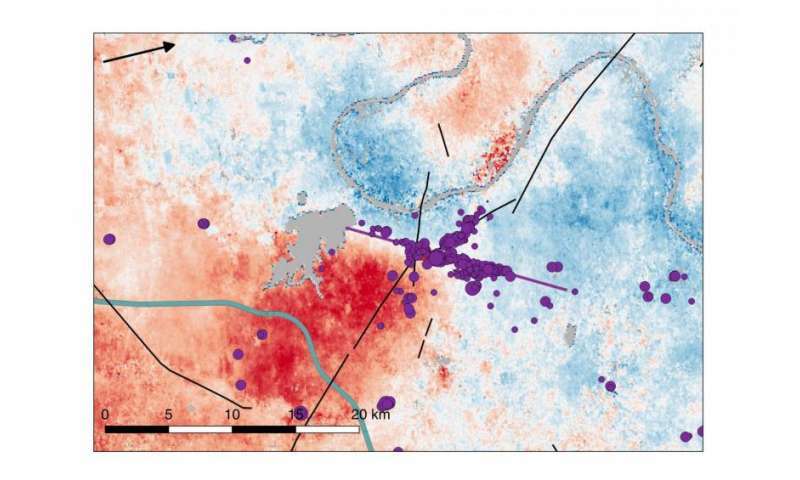 To help pinpoint which fault ruptured and where the main quake started, Fielding's team updated the locations of earthquakes published in an Oklahoma Geological Survey catalog of aftershocks. The catalog included nearly 2,200 earthquakes of greater than magnitude 1.0 within about 31 miles (50 kilometers) of the Sept. 3 main shock. Around Pawnee, the main faults are oriented in a northeast or north direction. But most of the aftershocks to the Sept. 3 quake occurred along a line trending east-southeast from the epicenter. As reported in earlier studies and confirmed by Fielding's team, this told scientists the main shock didn't occur on a previously mapped fault, but on a new fault called the Sooner Lake Fault. To determine which parts of the fault slipped in the earthquake, Fielding's team analyzed interferometric synthetic aperture radar (InSAR) data from the Copernicus Sentinel-1A and Sentinel-1B satellites operated by the European Space Agency and the McDonald, Dettweiler and Associates Ltd RADARSAT-2 satellite. The team compared InSAR data from multiple satellite overpasses before and after the main shock to create images of ground deformation known as interferograms. The Pawnee earthquake is the first Oklahoma earthquake to be observed using radar satellite data. "Radar satellites allow us to study details of earthquakes on faults that were not previously mapped and don't reach the surface," Fielding said. "This allows us to learn more about the processes that cause earthquakes." Interferograms created by the team from the InSAR data showed the ground deformed in a pattern consistent with slip along an east-to-southeast trending fault. The interferograms also showed the quake did not rupture Earth's surface, consistent with field reports. Fielding's team next input the aftershock and InSAR data into a computer to create models of the fault's likely location and of which parts of the fault slipped during the quake. Their preferred model of the Sooner Lake Fault calculates that it dips vertically and is 11 miles (18 kilometers) long and 9 miles (15 kilometers) wide. The model also calculates that the movement on the fault took place deeper than 1.4 miles (2.3 kilometers) beneath the surface, and that the parts that moved the most were located deeper than 2.8 miles (4.5 kilometers). These findings are consistent with a main fault rupture taking place in crystalline basement rock beneath more shallow sedimentary rock layers. The team's results show the main shock began at a depth of about 2.8 miles (4.5 kilometers) below the surface and moved downward to a depth of at least 6.2 miles (10 kilometers) and perhaps as much as 8.7 miles (14 kilometers), into the basement rocks below the sedimentary layer. This downward rupture direction is unusual for natural earthquakes. The fault slipped horizontally about 2 feet (60 centimeters) at a depth of 7.5 miles (12 kilometers). "Our results showing a downward fault rupture are consistent with a human-induced earthquake resulting from wastewater injection, rather than a naturally caused quake," said Fielding. Fielding said the research may help better manage induced seismicity. "By understanding how and where earthquakes are induced by wastewater injection, we may be able to mitigate their risk by identifying zones that should be avoided for injection," he said. The NASA-ISRO SAR (NISAR) mission, planned for launch in 2021, may help scientists identify faults responsible for earthquakes and learn more about their causes, both natural and human-induced. It will provide frequent coverage of all land areas twice every 12 days. Interestingly other states that have lots of wastewater injection wells aren't seeing an increase in magnitude 3+ earthquakes, like Pennsylvania, West Virginia, Texas, Kansas and California. Why is that? Nevada and Wyoming have also experienced a significant increase in earthquakes in recent years but as far as I know they aren't blamed on wastewater injection. Could it be that we simply don't know that much about why seismic activity increases and decreases? That's my bet. We've just assumed the Midwest isn't prone to earthquakes because they're rare, but they've had major earthquakes in the fairly recent past, like the devastating series of magnitude 7.5 earthquakes clustered around New Madrid, Missouri in 1811 and 1812. Vicious environmentalists will do anything to attack something that has at least partially freed the U.S. from dependence on foreign energy and has done so at a cost FAR below that of crappy solar and wind energy. Since most come from the West coast, lets hope California falls into the Pacific from the next big natural earthquake. 2.7 & 4.0 quakes near Youngstown OH likely cause by wastewater injection.